Bruleed lemon bars are the citrus dessert of your dreams. Super bright and flavorful with a crisp caramely crust. You will want to make these bars on repeat all year-round. 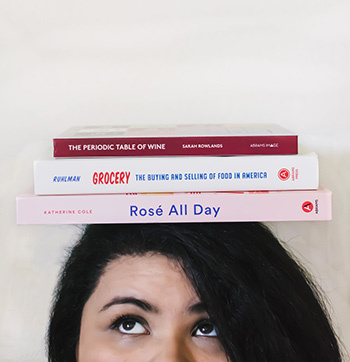 So one of my best friends, who also happens to be a baking/dessert blogger wrote a cookbook! Miranda of Cookie Dough and Oven Mitt has a little book called The Easy Homemade Cookie Cookbook which is just perfect for cookie addicts like us! I am so, so, so proud of her and absolutely love the book. 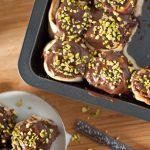 Everything just looks absolutely incredible and they are all truly super easy recipes and are done quickly. 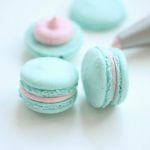 I had a hard time picking just one recipe to make and share here. Citrus desserts are probably my favorite desserts to eat. I do crazy over lemon everything and if something has a creamsicle twist, I am all over it. I still dream about my lemon meringue cheesecake and my lemon meringue popsicles. And no, it isn’t the meringue that gets me. There is something about the bright acidity of the citrus and the sweetness of baked goods that just gets me. So, when I saw Miranda’s super lemony lemon bars, I kind of felt like it was made for me (please don’t correct me if that wasn’t the case, Miranda!). I’ll be honest, at first I was wondering if it would be truly lemony up to what I like. I mean, if you look at any of my lemony sweets, I use a ton of lemon. But boy, my girl delivered! There is definitely a ton of lemon and it makes me so happy. I wanted to turn it into something I felt was a bit more fall/wintery and gave it a little twist. 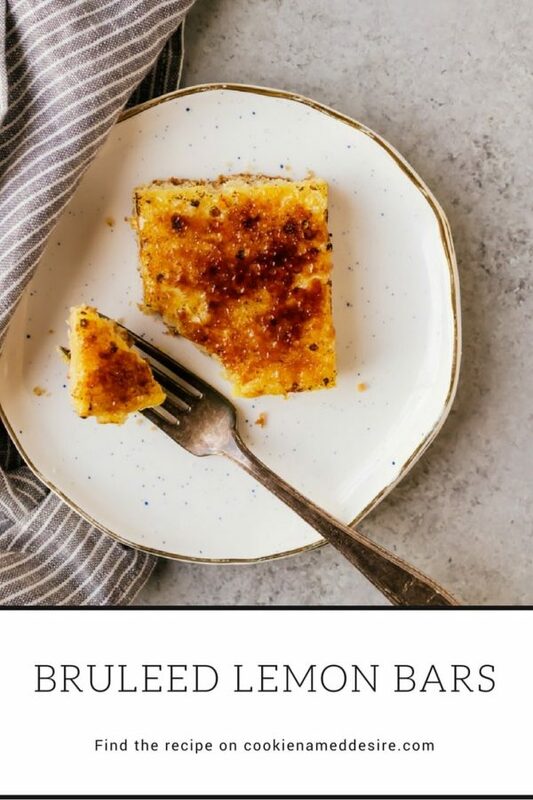 So these bruleed lemon bars have all the lemon flavor with a crisp caramely top that adds a really nice textural contrast. 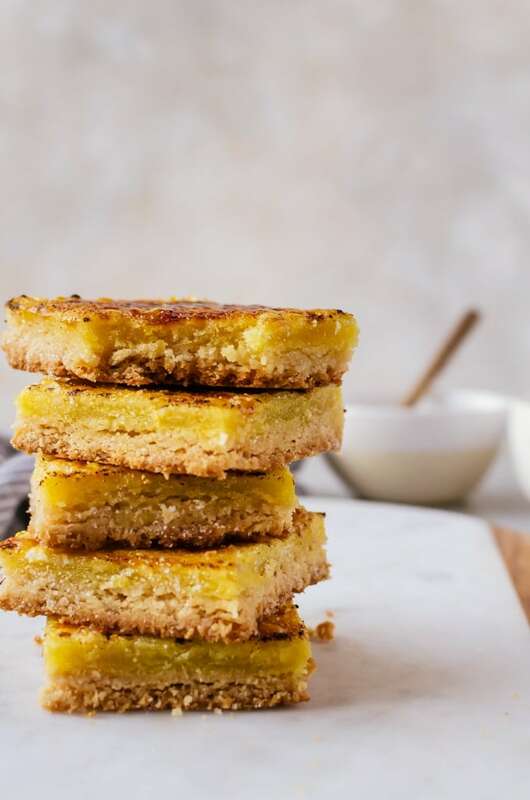 I think my favorite part of these bruleed lemon bars is that they are so quick and easy to make. Instead of making a proper curd, we make a simple mix that we pour over our crust that bakes up and gets curd-like which means you are all ready to go the moment the crust is ready. Plus the brulee top is just the icing (or caramel) on top! You totally don’t need it, but if you want something a little cozy, then definitely add it. 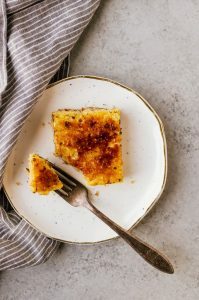 These brulee lemon bars are perfect for social gatherings or just sharing in general. They make a lot of bars, but they do go fast, so if you do want to share, I recommend making a double batch so you can still have some leftover for yourself. One note I must point out is that you should only brulee the top once you are ready to serve otherwise the caramel top gets soft and sticky. 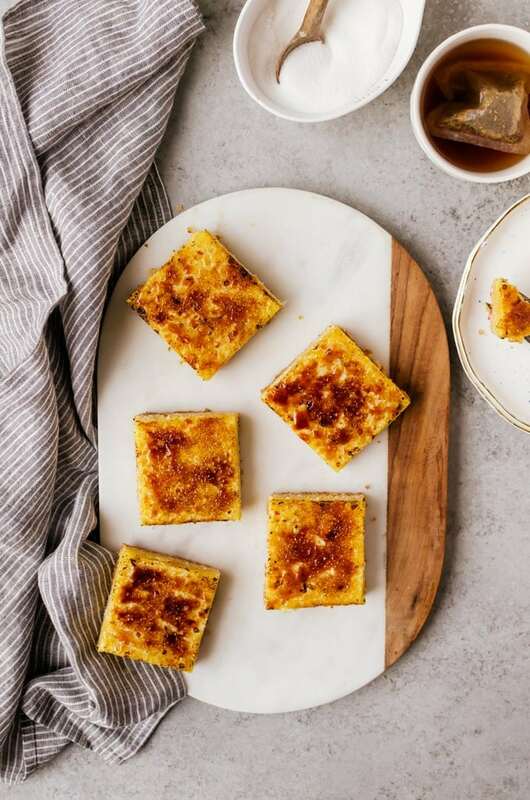 Super citrusy bruleed lemon bars that are perfect for cozying up with a mug of tea. Preheat the oven to 350 degrees F. Line an 11 x 7 inch baking pan with parchment paper. 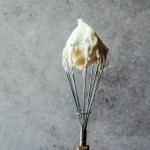 In a mixer, beat together the butter and sugar together until light and fluffy. Mix in the flour and salt until just combined. Place the dough in the baking pan and spread out into an even layer all around the bottom of the pan. While the crust is baking, Mix together all the ingredients for the filling until completely combined. Once the crust is finished, pour the filling onto the crust and bake for 30 - 35 minutes, or until the top is set. It may be slightly puffy in the middle, it will deflate. Cool to room temperature, then cut into bars. Sprinkle a generous amount of sugar onto the bars and torch with a kitchen torch, or place under a broiler briefly. Serve immediately. May store plain lemon bars without the brulee up to a week in an airtight container.